The IAS is soliciting submissions for the 13th Annual Jeanette E. Stephens Student Paper Awards. This paper competition is for undergraduate and graduate student research concerning Illinois archeology. The prize includes $250, books, and journals. The submission deadline is July 15, 2018. Students and Potential Sponsors: For rules and submission details, see the Stephens Award webpage. Educators and Employers: Please download and share the announcement poster. Call for papers: Conference on Illinois History. Deadline is May 1, 2018. The Conference on Illinois History is accepting paper or panel proposals on any aspect of Illinois’s history, culture, politics, geography, or archaeology. The Conference especially welcomes submissions exploring the upcoming bicentennial of statehood. We encourage submissions from professional and avocational historians, graduate students, and those engaged in the study of Illinois history at libraries, historic sites, museums, and historical societies. Proposals are also being accepted for teacher workshops. If you are a teacher who has created an innovative, comprehensive, or timely curriculum on an aspect of Illinois’s history, culture, politics, geography, or archaeology, please share your expertise with other teachers at the conference. The deadline for proposals is May 1, 2018. A one-page summary of the topic, including a description of the major primary and secondary sources used. A one-page resume for each participant. Send proposals to: Christian McWhirter, Abraham Lincoln Presidential Library, 112 N. Sixth St., Springfield, IL 62701, or Christian.mcwhirter@illinois.gov. For more information, call 217-785-9132. With the recent retirement of Joe Phillippe and David Halpin from the Illinois SHPO Office, Dawn Cobb (Illinois Department of Natural Resources) is once again the Coordinator for the Human Skeletal Remains Protection Act. If you have any questions regarding procedures or inadvertent discoveries of human remains, please contact her at her office. ISAS's 2017 annual report is now available! 2018 Permanent Fund Grants, Illinois Association for Advancement Archaeology, Deadline 1/15/18. The IAAA Permanent Fund has been awarding annual research assistance grants since 2004. These grants are open to avocational, professional, student, and educational groups for projects conducted within the state of Illinois. In 2018, the IAAA Permanent Fund will award two $400 grants. The deadline for grant applications is Monday, January 15, 2018. The application form as well as guidelines and requirements for a grant are available on the IAAA website under the Permanent Fund link (www.museum.state.il.us/iaaa). Call for Papers: IAS Annual Meeting. Deadline is Sept. 8, 2017. 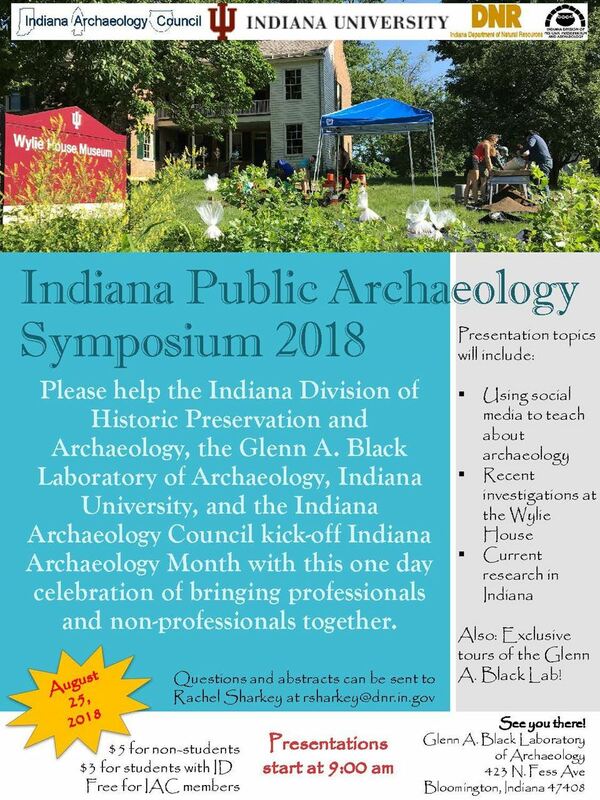 The Saturday (September 16) paper session will consist of a combination of current research papers in the morning followed by presentations on more specialized topics in prehistoric and historical archaeology in the afternoon. Paper lengths are 15 minutes. Poster presentations will be displayed outside the SIU Museum Auditorium rotunda throughout the day.